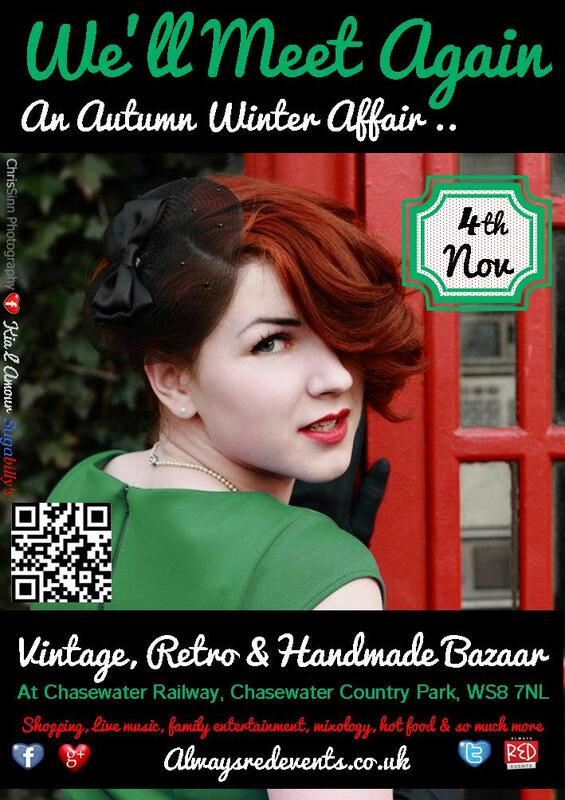 I notice that this Sunday, 4th November 2012, there’s a rather fun looking vintage event being staged at Chasewater Railway by Burntwood-based Always Red Events. The inaugural event last June was a whole bunch of fun and I enjoyed it immensely. This one promises to be even better, so why not get down there and join in the fun? Always Red Events returns to Chasewater Railway on this coming Sunday, 4th November 2012, with another day out for vintage fans and families. ‘An Autumn Winter Affair‘ follows the hugely successful ‘We’ll Meet Again‘, which took place back in June. The event raising money for the railway is a vibrant mix of all things vintage with sprinkling of handmade, craft and retro items. Giving this event a little extra ‘va va’ vintage is our line up of family entertainment, live music with String of Pearls Vintage Duo, The Jailhouse Rockers and The Chicken Shack Boogie Boys, plus dancing with Strictly Jitterbug. For the little ones there’s a Bouncy castle, face painting and free children’s entertainment. Wet your whistle and keep refreshed with Burton-on-Trent based Speakeasy Cocktails who will be working some mixology magic with themed cocktails and alcohol free mocktails. The Pop-Up Vintage Salon return to offer hair and make-up styling, including victory rolls, beehives, waves and curl sets à la Marilyn Monroe and Dita Von Teese, from just £5. There’s also the vintage ‘photo booth’ where you can have your photo taken and receive two vintage prints on the day. The Sidings Tea Room will be serving a Sunday carvery and afternoon tea. Please book a table by calling Jenny 07563 754498. Once again Chasewater Railway’s full service of trains are running throughout the day. So come down and say hello… We would love to see you there! With free parking and free entrance it’s an absolutely delightful vintage day out for all the family. Donations for Chasewater Railway will be kindly received though! This entry was posted in Brownhills stuff, Chasewater, Events, Fun stuff to see and do, Interesting photos, Local media, Local music, News, Reader enquiries, Shared media, Shared memories, Social Media, Spotted whilst browsing the web, Walsall community and tagged 1940s, 40s, 4th November 2012, Always Red Events, Brownhills, Chasewater, Chasewater Railway, Events, Facebook, New Photos, nostalgia, Staffordshire, Sunday, Things to do, Twitter, Vintage Event, We'll Meet Again. Bookmark the permalink. Looking forward to it. Thanks to all involved.